This beautifully arranged art show is the proof that vision and talent are thriving in our Seguin community. 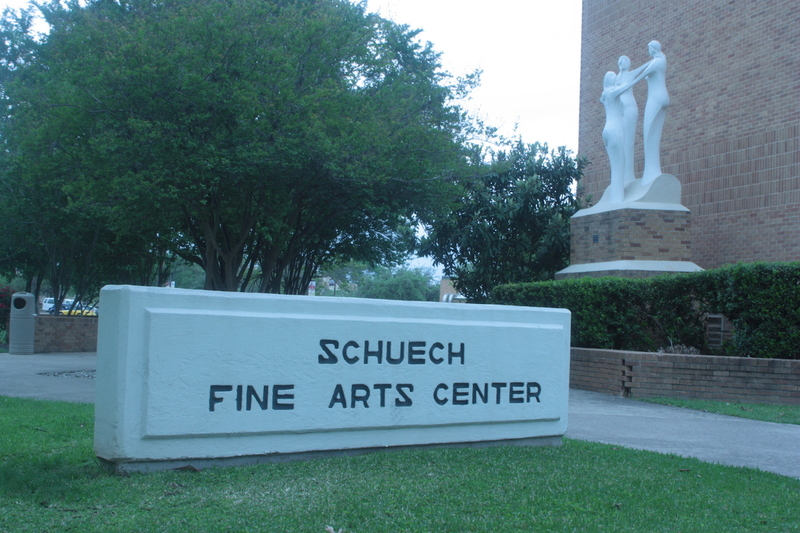 Located at the Schuech Fine Arts Center, the show closes May 8. This display of art is an excellent occasion to realize what is being taught at the university in our town. Visit and experience that breath of fresh air from our next generation of artists. Kyle Olson, Assistant Professor, The Department of Visual Arts, invited Marika Bordes and Dennis Martin to jury the Annual Student Art Show. What an honor! Thank you TLU for allowing us to be part of such an awesome venue. The students inspired us with their creativity, professional presentation of work, and diversity and depth of expression. Kudos must go to the teaching staff for unrelentingly bringing out, year after year, the best in their students. We are proud of you. 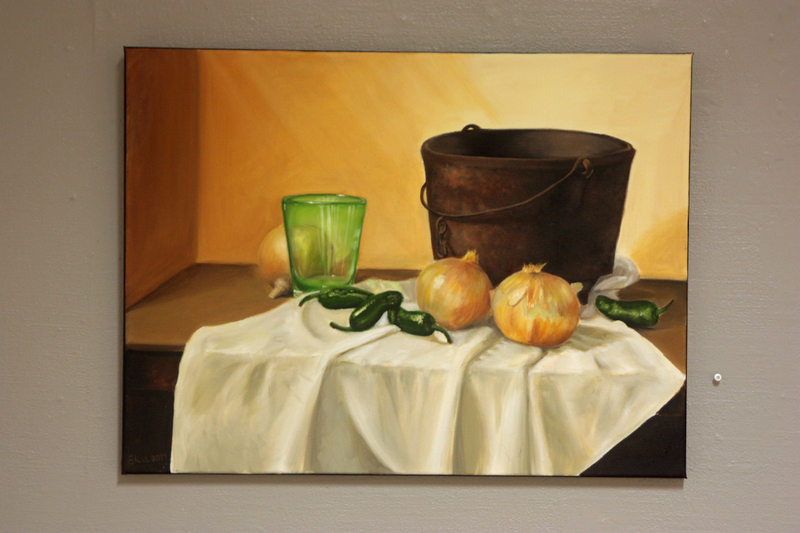 Emily Ullrich for “Peppers n’ Onions” an oil on canvas still life. At the opening reception, Emily surprised us with the news that the painting was her first using oil. Bravo! Physical presentation of the artwork: is of high standard. Conception in the planning of the art piece: is clearly executed. Mastery of the medium: is evident. Rendering of the use of light: is well executed. The WOW! factors: are lighting and texture. Cason Miller for “The Cyclops” a wood sculpture made from an old chair. Cason is planning a visit to Marika’s studio. We look forward to his visit. Creativity: It stands out from the crowd. The presentation of the subject is done in a way that it had not been done before. Artistic design: There is a sense of balance. The impact: Brings all the elements together to create a positive impact with recycled materials. For the President’s 2014 Christmas Card, a committee selected the art of Mary Grace Riddle. 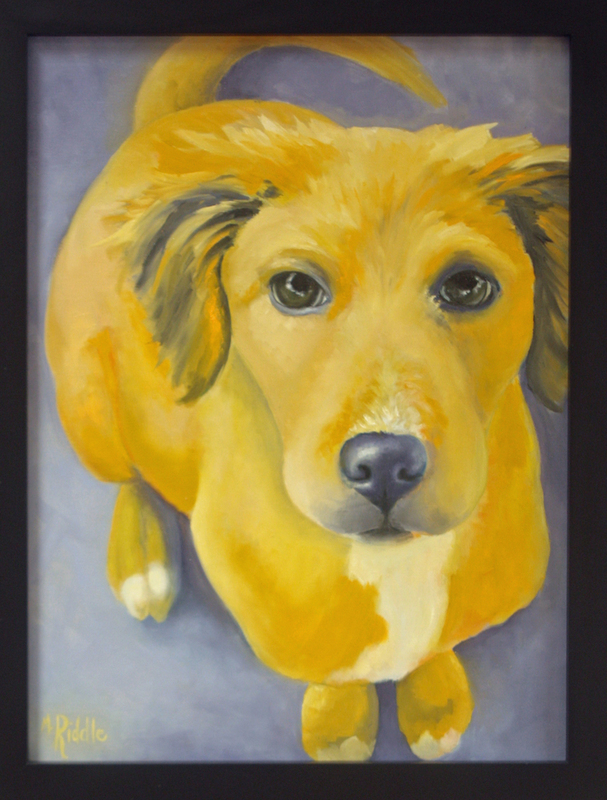 Mary also has excellent paintings of dog portraits. Wait until you see Ms. Juliet, the dog with the pleading-for-goodies look in her eyes. The jurors felt the artists followed many different avenues in medium and subject matter for the sheer joy of expression. One senses the strong effort in the use of technique, lighting and composition in the creative process. The jurors very much appreciated the creativity of vision found in the art. Impact overall, and the WOW! Factor. Our recommendation to each of you who entered the show is continue developing technique and creativity. Enjoy the world of art, its inspiration and your place in it. May you have a creative life. In the left column of this page are links to the Department of Visual Arts under “Art Organizations” and to Professor Kyle Olson and art student Mary Grace Riddle under “Artists”. This entry was posted in Fine arts, Seguin Art, Texas Lutheran University and tagged Cason Miller, Dennis Martin, Emily Ullrich, Kyle Olson, marika bordes, Mary Riddle, Schuech Fine Arts Center, Texas Lutheran University, Texas lutheran Unviersity Department of Visual Arts. Bookmark the permalink.